All morays, whether large or small, have extremely dangerous teeth in their mouths. Most kinds have a few rows of curved teeth with tips that are as sharp as needles. The fish's throat, however, is as deadly as its mouth. Scientists made this discovery recently, in 2007. At the University of California, researcher Rita Mehta filmed a moray eating, using high-speed video. When she played it back in slow motion, she saw something come up quickly from the fish's throat. It was a second set of jaws with sharp teeth. Among the most popular exhibits in aquariums across the country are the fascinating giant moray eels--long, sinuous, bright-colored, popping violently from crannies with open mouths, filled with needle-like teeth. 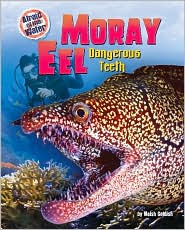 Meish Goldish's just published Moray Eel: Dangerous Teeth (Afraid of the Water), (Bearport, 2010) provides a close-up look at this amazing predator, found in shallow temperate and tropical waters around the world. Goldish begins with a couple of pages warning of the danger morays can offer to swimmers, leading off with a case of personal attack on a young diver. Although he points out that morays are shy and rarely attack humans unless threatened, the photograph of a moray bite will remind ocean goers to keep their hands away from possible moray lairs! The author goes on to describe the feeding habits, habitat, and life cycle of these intriguing animals. Text boxes on each page, full- and double-page spreads feature large color stills of assorted types of morays, maps, and scientific terms in boldface facilitate research and learning, and a final section, "In Case of a Bite," offers information on first aid. The text is backed up with a brief appendix, including "Other Things That Bite" (piranhas and barracudas), a glossary of terms used in the text, references and further reading, and a short index. There is a lot of intriguing information for elementary and middle readers packed into this 24-page text, made so accessible that youngsters will devour this one like popcorn. Other titles in the Afraid of the Water series include the eye-grabbing Shark: The Shredder (Afraid of the Water). My daughter sponsors an eel at the local aquarium so this would be perfect for her!